I have an aversion to carrying umbrellas. More often than not, I get distracted and I leave my umbrella behind. I got sick and tired of replacing them so in the end, I just don't bother carrying one at all. The only problem is it rains A LOT in the UK. I've been drenched on many occasions. I resemble a soggy cat with wet hair plastered to my scalp like a cap and make up running down my face. I've been relying on my Burberry quilted jacket for the past 2.5 years. It's a wonderful jacket which I picked up for, get this, £40 from their sample sale (instead of £395) but waterproof it's not. *sigh* Sad to say this but they stopped running their sample sales last year. Perhaps I'm vain because none of the sporty looking parkas appeal to me. I'm all for North Face and Columbia jackets on days when I'm trekking into the mountains. Which I will avoid like the plague. The ones sold at High St stores look cute but aren't waterproof which defeats the purpose of wearing them. I went really cheap and got a blue polyester raincoat from Asos for £12. This was truly a case of "you get what you pay for". I wore it once. Cost per wear: £12. Yup, that made it an extremely expensive raincoat which not only was as ugly as sin, it was bloody uncomfortable. There are ones that are so remarkably shapeless (who designed those crap!) I look like I'm wearing a sackcloth. I'm not tall and thin. Heck, I'm not even short and thin (rotund comes to mind particularly after a meal) so a waterproof coat with a nipped in waist really helps to create an illusion of a curvy silhouette. A hoodie attached is a must for practical reasons. Seeing this is the sale season after all, it's a good time to invest in a good raincoat at a discount. I have a budget of £150 which I feel is rather generous . It's recession after all. With utility and food bills rising faster than wages, one has to be sensible. I've seen a few strong contenders but they're no good for spring and summer months. I just happened to see this Gloverall Wax Cotton duffle coat on sale while doing some virtual window shopping. Perhaps this may be the answer to my prayers. I love this jacket, the toggles, everything!! Super cute. I'm on the look out for a rain/trench- coat too, but i'm unwilling to spend too much money either. Last winter I got the Barbour Featherweight Parka in Black (also waterproof within reason), which is perfect for winter in my city, but too warm for between the seasons. 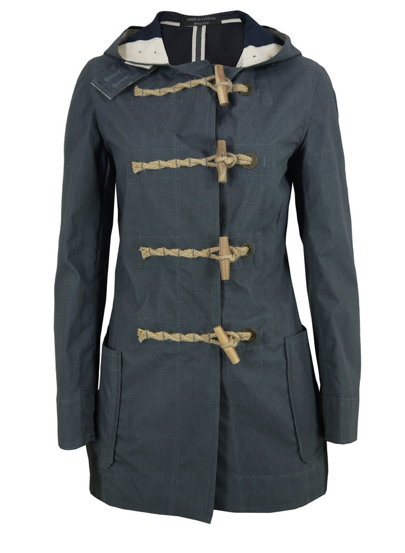 One of the brands I like is Aigle Ladies, similar sporting goods like Barbour, a little less pricier. They have a nice collection of waterproof coats and jackets. Mary Ann, thank you! I'm loving my new jacket a the moment. lily, hubby's a huge fan of Barbour and wanted to buy one for me. I'm reluctant to part with so much ££. I saw a few but there were too thick for spring/autumn. I didn't think to search for Aigle raincoats. Hope you're having fun in Greece! I Like it! Boy, I wish I'd had that coat in Amsterdam last month! !